“Rounding Third” is a modest piece with ambitions beyond its reach. It will never be as poignant or commentating as playwright Richard Dresser intends it to be, but as a light entertainment that glances on some current topics and offers some character study, it can be divertingly enjoyable. The important thing is not to expect too much and to realize any depth Dresser looks like he might plumb won’t get you wet past your ankles. That said, Act II Playhouse, with Tony Braithwaite and Michael Basile going head-to-head as baseball coaches with different philosophies towards sportsmanship and different attitudes toward parenting, finds a way to amuse with Dresser’s generally inconsequential two-hander. Braithwaite and Basile assay their characters well. They each seem to be well acquainted with the man they’re playing and are able to bring dimension to the stage that “Rounding Third” sorely needs to be more than a dismissible, sentimental flapdoodle. Basile is totally recognizable as the gung-ho coach, a man who lives for baseball season to start every year so he can relive the glory of his Little League and high school playing days and extend his reputation as the man who brings annual sports championships, albeit in Little League, to an otherwise sleepy, and fairly parochial, small town. The first thing Basile’s character, Don, tells Braithwaite’s character, Michael — Not Mike, or Mikey, but Michael — is that everyone in town knows him and loves him. Talking to Michael, Don is brash and a bit crude. He is easily at home on a barstool, and Basile has Don’s slangy patter and shot-and-beer affability down pat. Don lets Michael know right away he is a man of standards who plays to win. Michael, being a few minutes late for their first appointment, upsets him, and Don stresses punctuality that will be an issue throughout Dresser’s play. In addressing his team, Don tells the kids I guess to be between the ages of 8 and 12 that winning is everything and that they will have more fun in baseball if they are unfailingly victorious. In this, he sounds like a sports radio talk host who takes every professional team loss as if the Earth has veered from its axis, and we are all in mortal peril. Don also tells the kids he will be lenient with them when they make physical errors, such as missing a bad hop, but will come down hard when they commit mental errors, such as missing a cut-off man or not paying attention on the base pads. Braithwaite’s Michael is Don’s opposite in every conceivable way. He is soft-spoken and emotionally withholding. His demeanor is one of a serious businessman, and his humor is subtle and pointed, sophisticated and ironic rather than broad or bawdy. In anything but a play, Don and Michael would be together for exactly two minutes then part ways forever, good riddance, adios. For one thing, they meet when Michael, new to Don’s town after being reassigned there by his company, signs up to work with the Little League in some adult capacity, i.e. serving as an assistant coach. Michael has several motives. One is to get to know people in a new place. One is to guide his son into an activity that might be an antidote to his shyness, to make him more “one of the boys” now that they have relocated and are looking for some changes in their lives. In his first conversation with Don, Michael reveals he never played baseball. He says he grew up in Canada, and his sport when a kid was curling. Not hockey. Curling. Dresser has already fouled the water with a lame joke when there was a plausible alternative. No one is so naïve as to equate curling with more common sports , so you see the playwright is going for the cheap laugh, if indeed a laugh erupts, rather than some core of truth that might be understood. The move is second-rate of him. It also nullifies any use Michael can be to Don, even if someone at the league office was cynical enough to pair them. Even we, the audience, don’t want him around the team. Michael also tells Don he is eager to learn the game and can’t wait to work with the children Don is ready to recruit after inveigling his son to do some shrewd scouting about which kids to draft. A guy like Don, loose and interested in woman and beer as well as baseball, someone who would be at home in any tavern among almost any group of men in the United States, would not be able to stand a guy like Michael. He’d reject him on the spot. And he’d be right to do it. He is man who doesn’t come forward. He is civil to a fault, he seems to have no knack for “hail, fellow, well met” camaraderie about him, and he is as opinionated as Don but comes across priggish and superior instead of as just a guy having his say. Michael has boardroom poise, and an ability to stick to any gun he is reluctantly inclined to draw, but he has no spirit and seems more suited to the chess board than the athletic field. And he can’t tell a bunt from a hot dog bun. He doesn’t know baseball. How is he going to help anyone coach a team? He is an undisguised liability to any baseball venture from the get-go. No one with any sense would let him instruct in a curling league let alone trust him to teach kids fundamentals of a sport he never played. Dresser obviously asks us for a wide swath of indulgence. In his set-up, Michael’s the good one, the one we should be rooting for and admiring. His premise doesn’t hold water, and “Rounding Third” is not ultimately funny or charming enough to make us buy what’s going on. Even when Michael emerges as educable, compassionate, and worthy of our support. Dresser is aiming for an “Odd Couple”-type relationship between Don and Michael. In doing so, he misses two salient points. His characters do not have the long-standing relationship Oscar and Felix do. There’s no logical basis for Don to take Michael in or to try to help him adjust to a new situation or surroundings. The other point is Richard Dresser is not Neil Simon. He gets his play’s structure right — Scenes move well enough and come in the right order — but he doesn’t nearly have Simon’s felicity for weaving jokes and funny phrases amid exposition or serious conversation. Yes, a line or two provokes a laugh. Basile and Braithwaite each provide strong comic moments that keep “Rounding Third” rolling along. But Dresser’s script is nowhere close to the quality of “The Odd Couple” and “Rounding Third” cannot be compared to Simon’s play except for pitting two diametrically different characters against each other for 100 minutes. Don, in any real-life setting, would flee from Michael in 100 nanoseconds. Of course, today’s American suburbs are a real-life setting of politically correct hoo-hah, places where people take a deep interest in whether you got your dog from a shelter or a kennel and where keeping score during soccer games is eschewed among people who want sports to be recreation and teambuilding activities, as opposed to those who regard sports as competitive and played with an idea towards winning. In Dresser’s world, and I’m afraid in our own, Michael, volunteering to help in the town’s Little League program, would have to be accepted, and Don would have no choice but to welcome him aboard. So Don and Michael are a team, like it or not. Don can shunt Michael to a minor, or practically non-existent role, but Michael has the right to assert himself and not be put quietly in a corner. “Rounding Third” proceeds with the men clashing over everything. At the initial gathering of the team, Don carefully relates his rules for discipline and attitude. These include winning as a top priority and attention to basics, including matters of punctuality and personal hygiene. Don arrives late, traffic being the culprit, and immediately addresses the boys, telling them that sportsmanship, everyone getting a chance to play in every game, and having a good time is more important than winning and that they should relax and have fun and not think of anything but getting good exercise, meeting new friends, and enjoying their time on the diamond. Here Dresser is on to something. He’s defined a legitimately pressing conundrum of our time, whether a program for children should be all-inclusive and geared towards socialization or whether it should be plotted to meet an objective, such as winning an athletic contest or putting on the best possible school musical, even if Little Johnny is stuck blowing up balloons backstage because he’s the only thing for which he’s fit. The nice, proper attitude, the acceptable politically correct stance in a world some people would decidedly prefer to be Stepford, is to side with the folks who want all activity to be pleasant beyond any other stated purpose, like winning a goll-darned game! Frankly, I stand with Don. Baseball has a score, and the primary point is for one team to score more runs than the other. Dresser shows the contrast and conflict in Don’s and Michael’s attitudes. We get the irony and realize that any time Michael speaks, Don’s blood has to boil. From Don’s point of view, sabotage is afoot. From a common sense point of view, Michael’s ideas are sweet but decidedly wrongheaded. For each of the men, those ideas come from a deeper place than a clash of suburban culture. In the long run, Dresser uses “Rounding Third” to reveal events that influenced Don’s and Michael’s lives and attitudes. We learn a lot about the two men. Don’s problems don’t seem as large and are more self-made than Michael’s. Michael is the focal characters, the one who’s world was upset and who has to find a new life with a ready-built family in a new place he came to only because his boss assigned him there. Michael’s is the story of interest. He is the one who has a life to create, a life about which he wants to change significant elements, but one that has a basis in the way he’s been treated most of his life and his style of dealing with adversity, including a telling instance for which he was penalized for his decency. Tony Braithwaite is masterful in unfolding that story. Michael, at the beginning of “Rounding Third” is as much a pain in utilitarian places to the audience as he is to Don, who is not perfect by any means but is nowhere near as pinched or as self-righteously new age as Michael is. Braithwaite is moving as he reveals information Michael has been keeping to himself, details that explain the character’s guiding motive for wanting him and his son to be involved in Little League baseball. We are also gratified as Michael makes changes that strengthen him as an individual, and as a team player, while making him less formal and rule-bound. This is the story Dresser writes a play to tell, and Braithwaite gratifies him with a neatly measured and ultimately effective low-key performance. Braithwaite and Basile save Dresser’s life in the Act II production, directed with sensitivity by Matt Silva. They give humanity to a play that has a lot going on but presents it in the most saccharine ‘oh what a good boy am I” way. Braithwaite is able to derive some depth from Dresser’s shallow approach to his subject and his sentimental hack’s way of bringing the important or empathetic to the fore. Basile is so much regular-guy, so convincingly natural as the guy Don is supposed to be, you barely see a performance. The actor seems to be living Don’s moments. Braithwaite has to withhold energy and personality in the same way Michael has to withhold revelations that would clarify his stances and make him more appealing or sympathetic. His success as doing so is quite a feat for an actor we think of as having no inhibitions or holds to keep him from being large and expressive on stage. 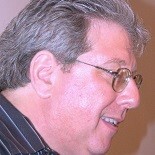 Basile rescues Dresser by keeping “Rounding Third” lively and funny and as real as Dresser will let it be. Braithwaite does the playwright an amazing favor by turning Michael in a moving character against stacked odds. Dresser handicaps Michael because he thinks suppressing information and saving key revelations until the end of play are good devices. They are, when the new information comes naturally or is perceived or discovered by another character. When a playwright is simply and self-consciously withholding salient facts because he wants to force an emotional reaction from a delayed surprise late in the play, his would-be shrewd devices turn into cheap tricks, an ace emerging from a sleeve to dishonestly bolster a hand that would go down to defeat without some desperate chicanery. As compassionate as Braithwaite makes us feel towards Michael when we learn all he has endured, Dresser has been lazy and smug by throwing such dramatic material at us all at once. It turns his play into a melodrama, a soap opera. We like seeing the effect his coaching experience, and his time with Don, has on Michael, now congenial enough to let folks call him Mike, but we notice Dresser’s manipulation. Michael’s epiphany doesn’t seem to come naturally. It seems forced on us. Dresser doesn’t know how to foreshadow it, and upon thinking back to the play and the Act II production, I see no way in which Braithwaite or Silva could have bailed him out or signaled the coming empathy. Dresser has things to say and illustrate. Some of his observations are astute, and he does develop Michael’s character. My complaint is he goes about his business more like a plodder than an artist. Braithwaite times Michael’s advancements well. Basile’s character, though inconsistent as written, has no room to advance. He comes out of the chute with high energy and a big personality. As his world deflates, Don becomes more humble, and Basile catches that, but again you see the seams in Dresser’s construction. Dresser manages to give Don some texture and an admirable dose of sensitivity. Once Michael gets to see a clipboard Don has kept to himself, you learn something about Don’s coaching of children that is affecting and alters your opinion of his depth. For the most part, Don is a non-stop spouter of man-talk clichés. He’d be equally at home in a Bruce Graham comedy. His demeanor as a coach reminds you of many a gym teacher. His jokes have a familiar tone of misogyny and prejudice. One thing you do know, Don is always frank and true to what he means to say. As I said earlier, he would do well on a radio talk show. Michael, on the other hand, doesn’t have Don’s snap or easy rapport. He would need a coach to teach him how to include “man” in a sentence, as in, “Good catch, man” let alone to go into guy riffs Don can dash off at any time. Because of Basile, Braithwaite, and Silva, “Rounding Third” doesn’t have to defeat its weak points to be entertaining. The actors and director take care to make sure there will be enough to watch that pleases. Adam Riggar’s set nearly serves several purposes. Jill Keys’s costumes are right on the mark, especially her selection of burbo shirts for Michael. “Rounding Third” runs through Sunday, October 12, at Act II Playhouse, 56 E. Butler Avenue, in Ambler, Pa. Showtimes are 8 p.m. Wednesday through Saturday, 2 p.m. Wednesday (in September), Saturday (in October), and Sunday. At 7 p.m. Sunday, October 5, Act II presents a concert by singer Peggy King, once billed as “pretty perky Peggy King” on the “George Gobel Show.” Tickets to “Rounding Third” range from $35 to $28 and can be obtained by calling 215-654-0200 or by visiting www.act2.org. 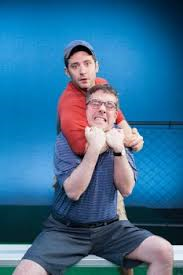 This entry was posted on September 17, 2014 by nzoren in Theater Reviews and tagged Act II Playhouse, Ambler Pa., Baseball, Comedy, Matt Silva, Michael Basile, Richard Dresser, Rounding Third, Theatre, Tony Braithwaite.